Steve inside his Sound Pod. Steve Marshall’s Exploring Avebury, published in May 2016, has quickly become the definitive guide to the world’s largest stone circle located in Wiltshire in the UK. There has been nothing but praise and rave reviews since its publication. The book was Steve’s left brain response to the sacred landscape. Now we have his right brain, emotional response – Avebury Soundscapes, an extraordinary album of music inspired by the standing stones, Silbury Hill, West Kennet long barrow and other sites in the Avebury landscape. Last year, I spoke with Steve about his book (click here to read the blog) – this year, our conversation is about the album. Read on and, like me, marvel at Steve’s creative and innovative approach to recording and mixing music. You can listen immediately to the music through the links below which take you to each track on the album and to Bandcamp where you can purchase individual tracks or the whole album. So, what’s Steve’s background and what led him to create a musical homage to Avebury? 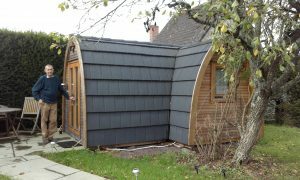 Steve about to enter his Sound Pod. 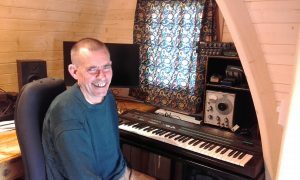 STEVE: As a film composer for 20 years, I created music for hundreds of TV documentaries – mostly for the BBC and Channel 4. I’ve also been a musician for most of my life. About 10 years ago, fed up with the direction TV was taking, I stopped composing and turned to writing – for magazines and, of course, Exploring Avebury which took seven years to write. This was ‘pukka’, super accurate archaeology, which was great because that’s what I set out to do. And naturally, I’m delighted with how well the book has been received in the archaeology world. But the archaeology is only one aspect of Avebury. People who are real Avebury lovers, are usually more interested in what they feel when they’re in the landscape – the mystical side of Avebury. When I moved to Wiltshire in 1993, that ‘feeling the vibes thing’ was my first response to Avebury. In fact, Geomancy, the last track in the album, is a re-mix of a piece I composed 20 years ago. It contains recordings I did in the church at Alton Priors, where I lived when I first moved to Wiltshire. LINDA: The word “mystical” is used in many contexts. What does it mean to you? STEVE: For me, in terms of sound, “mystical’ means harmonics. I’m into overtone singing which you’ll hear quite often on the album. Some of the harmonics are done on synthesizers, others on Woodstock Chimes. These come from a company based in Woodstock in the USA, started by Garry Kvistad, a top-flight percussionist, who became interested in archaic tuning instruments. His wind chimes are perfectly tuned in what’s called “just intonation” which is the most harmonious way of tuning. I recorded our four sets of chimes at half speed or lower to produce a beautiful harmonious chiming. The River of Souls track starts with Woodstock Chimes and the chords develop from there. Steve preparing to whirl a bullroarer in the passage of West Kennet long barrow. LINDA: Could you explain a little about overtoning? STEVE: Overtone singing is popular in Mongolia but it’s all over the world now. You sing a drone, then by changing the shape of your mouth, you exaggerate the harmonics which allows you to play a tune. I can just about play Amazing Grace! When I take people to passage graves like West Kennet long barrow. I demonstrate the acoustics by whirling the bull roarer, but I also use overtoning. Click this ‘Play’ arrow to hear Steve demonstrate overtone singing with a handy hint on how to get into it yourself! LINDA: You’re obviously someone who’s acutely aware of sound. Give us examples of ways in which you’ve manipulated sound. When recording wildlife and weather (e.g. a fabulous thunderstorm) in the Avebury area, I used something called binaural recording which you can do several ways. One is to use a model of a human head with microphones where the ears would be. I used to do it that way, but now I put tiny microphones in my ears, pointing them outward. It’s the sound equivalent of a hologram . There are only two channels but it records in 3D, and when you play it back with headphones, you have complete surround-sound – above, below and all around. Click the Play arrow to hear Great Circle and select the forward and back arrows for other tracks. Exaltation is track 6 and Bone Ceremony is track 9. The ‘Buy’ link takes you to Bandcamp where you can buy individual tracks or the whole album. LINDA: Tell us about Bone Ceremony. STEVE: It’s an imaginary coming of age ceremony in West Kennet long barrow. Much of it is recorded inside the barrow, but I also sampled music there using what’s called a convolution reverb, which recreates the ambience of a space, so that anything you play through it sounds as though it’s in that space. West Kennet long barrow has an infrasonic resonance of 9 Hertz that can affect brain waves and potentially produce “altered states”. The rhythm of 9 beats a second is one way of resonating the barrow, the other way is with a bull roarer. Imagining how a priest would speak, I chanted an incantation in Proto-Indo-European, a language that was used all the way from western China to Iceland from 4,000 BCE. There’s a translation of the chant on the sleeve notes. It summons the ancestors and ends with drummers banging away at 9 beats a second. When it stops, whooshing noises herald the arrival of four ancestors who appear, one at a time and announce themselves as great grandfather, great grandmother, great-great grandfather and great-great grandmother. The whooshing sound coming from above in 3D, is actually the sound of rockets backwards. Members of a local rocketry club used to turn up at Avebury with really expensive toy rockets and they let me record them. I got as close as I could (which, for safety reasons, wasn’t as close as I would have liked) and recorded the whooshing noise of rockets shooting into the air with microphones in my ears. I ran the sound backwards so you get the whooshing noises coming from above smashing into the ground as you hear ‘I am your grandfather’ and so on. At the end, the four ancestors swirl around, dissolve into a flock of rooks and whiz off into the air. 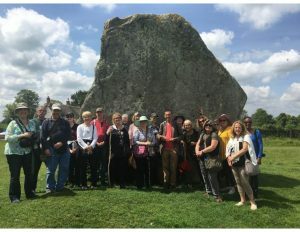 LINDA: On the Tarot Magic in Merlin’s Britain tour this year, you were our guide at Avebury and West Kennet long barrow. Now that Avebury Soundscapes is out, what can we expect from you as our guide in 2018? STEVE: It’s interesting to listen to tracks with headphones while you’re actually at spots which inspired the tracks. With the exception of Windmill Hill, they’re all within walking distance of the Henge. The first track, First Light, is an impression of walking into Avebury just before dawn. Listening to the music as you walk into the Henge is strange because you hear birds flying above your head out of trees that are not there! Many people feel that Avebury is like an electrical generator or battery, so I set about finding a way to bring this into the music. At home we have an induction cooker which makes a buzzing noise when you switch it on. I recorded the sound and incorporated it into the track. So you hear the sun rise with sizzling electrical noises circling around your head. When I was doing the surround sound aspect of the album, I rigged up a large wooden cross with speakers on the end of each of the four arms. I hung it from the ceiling on a rope, which meant I could play sound through the speakers, rotate the rig and record the sound with microphones in my ears. The effect is sound going smoothly around you and past the back of your head. I did this, for example, with the buzzing, humming sounds that rotate around you in a circle as the sun rises over Avebury at dawn. Very cosmic! LINDA: This is such a different way of looking at Avebury. STEVE: Yes, it’s totally different to the book. It captures things that are difficult to write about, but I can express them in music. LINDA: And you even take listeners to places that don’t exist! STEVE: Yes, that’s The Sanctuary track. I usually describe The Sanctuary as one of the least satisfying monuments because it doesn’t exist any more! East of Silbury Hill there was once a mysterious geometrical structure of timber posts, arranged in concentric circles of 6, 8, 12 and 16 posts each. Like Wood Henge, it has concrete markers where the posts used to be. It’s one of the first tracks I worked on. In the second half of the track, you can hear the 6, 8, 12 and 16 division of the circle in the rhythm. A good example of something that’s difficult to describe in words, but musically it makes sense. LINDA: How long did it take you to compile the album? STEVE: I already had lots of sounds recorded around Avebury, but it took ages to sort out which bits to use. I started in early 2017, and because I was using my phone and tablet, I could work anywhere – on buses, trains and planes with headphones on. When I had the tracks done, I took them into a friend’s studio just outside Avebury and he improved everything. That happened a few times. It was a long process – about nine months. Listen to some of the tracks on Steve’s album Avebury Soundscapes. How evocative were they? What do you think it would be like listening to them in surround sound on location in Avebury? We’d love to hear from you.